Sgt vaccines evlonu sollunga sir.please. In krishnagiri dt 400 Sgt vaccines. Thank you murthy sir.you knew overall tamilnadu.anybody tell me please. Anyone know when tet 2017 merit will be published, eppo posting poduvanga..
its only mentioned for high school & higher secondary schools. what about middle school BT vacancies??? anybody know???? Wr u from which district? My weightage is 68.4. English major kanchipuram. Any chance sir? TRB forgot paper 1 CV nd postings? 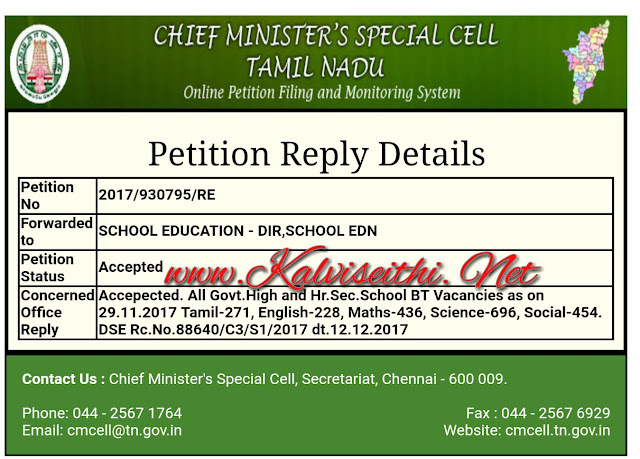 ஐயா நல்லவங்ளே டெட்லயும் ஊழல் இவல்லாம இருக்கனும். what bcm tamil cut off ? I am also sgt . Maths major mbc 68.79 is there any chance? Sg10% ill ??? Pray to God for us. If anyone knows vacancies of BT English in chennai district..
cm cell ல் எப்படி கேள்வி கேட்பது?எப்படி Register பண்ணுவது ? I'm tamil tntet 2013patch pass any information.